Democrats took back control of the U.S. House last night, winning the 23 seats they needed for control, plus some. Counting continues this morning in some marquee races too close to call. 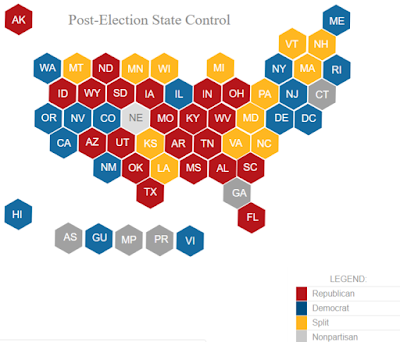 At least six state legislative chambers flipped from Republican to Democratic control, below the 12 seen in similar cycles going back to 1900. Trumpism took a hit last night, but did not go down. Democrats won governorships in Michigan and Wisconsin where Donald Trump victories in 2016 gave him the White House. Reuters reports by this morning Democrats had flipped at least seven Republican-held governorships. Democrat Andrew Gillam lost his bid for Florida's governorship. The race in Georgia between Democrat Stacey Abrams and Brian Kemp remains too close to call. Abrams trails but has not conceded. Progressives will take comfort in seeing Wisconsin's Scott Walker and Kansas' Kris Kobach going down to defeat. Republicans flipped U.S. Senate seats in North Dakota, Missouri, and Indiana, increasing their majority by two. It was a "massive night for female candidates" from both major parties. With races still outstanding, CNN projected 98 women would win House races. Women are competing against each other in two undecided races, so at least 100 women will serve in the House next year, a record number. The tilt favors Democrats. Democratic victories are still being tempered by the losses. Two longer-term results. First, state Democrats now look to 2020 races to help them gain control of redistricting in 2021. Advances in flipping legislatures last night make that more possible. Second, Democratic control of the U.S. House makes life harder for a Trump administration. Already facing the outcome of special counsel Robert Mueller's investigations, the sitting president now faces House investigations led by new Democratic committee chairmen beginning in January. Late last night, MSNBC's Ari Melber reported the ranking member of the House Ways and Means Committee, Rep. Richard Neal (D-Mass. ), will request President Trump's tax returns, teeing up a confrontation with the White House even before Democrats take control. Expect Trump to move quickly now against Attorney General Jeff Sessions as he reinforces barricades around the White House and goes on attack against Mueller. Star Fox News host and informal Trump adviser, Sean Hannity, joined Trump in campaigning for Republican candidates in Missouri Monday night. CNN reports news staff at Fox are "livid." While a Fox News spokesperson claims the "unfortunate distraction and has been addressed," there were no details of how. If it was not clear to the world Fox News is effectively state TV under Trump, Hannity confirmed it Monday night. Tuesday night was just a skirmish.